As we move towards a digital future, there must also be a sustainable infrastructure to support it. Data storage is now fundamental to every organization as everything seems to be digitized nowadays. With the growing needs for data storage, hard drive manufacturers are pushing the limits to produce products of higher density and capacity within the same form factor. Seagate, being one of the leaders in Hard Drive technologies, was the first to bring to market a 14TB 3.5inch Hard Disk Drive last year. With impressive specifications and ratings, it made us curious of what these fancy new hard drives are all about. Let’s take a closer look at the technologies involved in designing and developing such high capacity hard drives, and also how well it performs. The Seagate IronWolf Pro series of Hard Disk Drives (HDD) are created specifically for Network Attached Storage (NAS) systems. Even though they will work equally well when attached to a usual computer system, they have been optimized for the applications on a NAS. We will look into the IronWolf Pro’s unique features in the later sections. The IronWolf Pro is designed and engineered to meet the demands of high throughput/multiple user access scenarios in Small and Medium Enterprises and creative professionals. Be it streaming, archiving, or downloading of high-resolution video or work files, the IronWolf Pro will fit the application. Seagate doesn’t just sell you the HDD, they also understand that a peace of mind is necessary. This is why, the IronWolf Pro comes with 5 years of warranty. Moreover, the purchase of the IronWolf Pro also comes with 2 years of Rescue Data Recovery Services which gives you access to a global team of world class data recovery experts, in the event that the hard drive fails to do its job. AgileArray technology is built right into the Seagate IronWolf Pro hard drives. 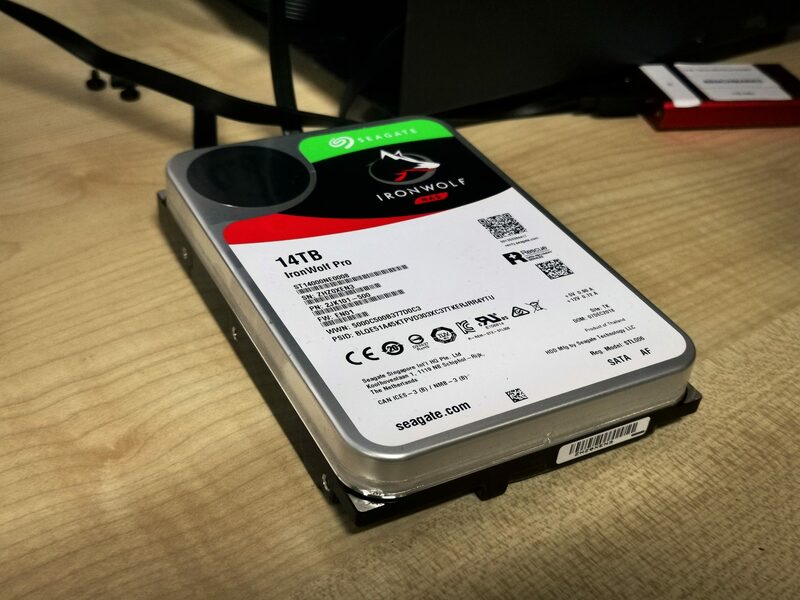 In case you are wondering what AgileArray is all about, it a suit of methods that is ingrained to the hard drive’s hardware, firmware and software to make sure that the drive is optimized for the usage scenarios for NAS. Error Recovery Control maximizes responsiveness and uptime, allowing the drive to remain available, minimizing downtime. RAID Optimized Firmware means that on an IronWolf NAS drive, the firmware is optimized for multi-drive RAID configurations, where the firmware on a standard PC desktop drive would be optimized for standalone single-drive configurations. This is important because unlike a single hard drive volume, a RAID volume generally has data distributed over multiple drives. So, large datasets such as video files reside over many drives, and without RAID optimization that can pose inconsistent performance issues. Advanced AcuTrac Technology allows Seagate IronWolf drives to function even under an extreme vibration condition with minimal performance degradation. It prevents vibration from a neighboring drive or chassis fan from negatively impacting individual drive performance, which also prevents overall system performance degradation. Dual Plane Balance ensures the drive is vibration-free and quiet during operation. The result is a consistent and reliable drive that provides consistent NAS system performance. With extreme workload rates, Rotational Vibration (RV) Sensors reduce vibration in the multi-bay enclosures, to maintain fast and smooth data transfers. AgileArray’s Streaming Support means every Seagate IronWolf drive supports the ATA-8 streaming command set, and the firmware is optimized to handle large sequential block transfers that are found in most video files. Since this is a review of the hard drives, rather than a NAS system, we will focus on how these products perform when directly connected a PC via a standard SATA 6Gbps interface. We will talk about the various features of a compatible NAS and how the Seagate IronWolf Pro is optimized for NAS operations in a separate review. In our tests, we are going to focus on how the drives performs under different scenarios. Specifically, we want to find out how the drives reacts when writing or reading large data samples (e.g. 64MB blocks) as compared to small samples (e.g. 4KB). We also want to know the differences in speeds for random read/write and sequential read/write tests. Let’s start off by looking at the maximum raw performance of these drives. ATTO Disk Benchmark measures the speed of the drive by placing or reading data sequentially in the drive. This essentially means that data are placed next to one another on the disk, and that data can be read very quickly, as the disk head does not need to move across multiple locations on the disk in order to write data. As we can see, when reading and writing data on the drive sequentially, the drive can reach a speed of about 260MB/s for both read and write operations for sequential data sizes of 8KB and above. When dealing with smaller data sizes, read and write speed suffers. As expected with the CrystalDiskMark test, sequential speeds of the Seagate IronWolf Pro 14TB looks great. However, like many other hard drives, while randomly accessing or writing data, performance suffers greatly. This is because there is a need for a physical movement of the disk head to reach another location on the drive before operations can be done. That is why, we can see that random read and write of 4KB data blocks on the drive could only reach 3MB/s. But there should be no worries, as this simply shows a worst-case scenario, as usually data are written next to one another. Moreover, drives can be defragmented to improve performance and increase the likelihood of sequential read and write operations. The Roadkil’s Disk Speed benchmark also measure the read speeds of a hard drive. As we can see, it takes the drive about 7ms in order for its disk head to reach a certain location. In computing terms, this a actually a lot of time. We can also see the random read speeds of the Seagate IronWolf Pro 14TB across various data block size. As expected, with smaller the data blocks, there will be a higher number of disk head movements. With multiple 7ms access time accumulated for small data blocks, the raw speed of the drive will be slower. While the performance of a hard drive isn’t really something interesting to talk about as it has been superseded by faster flash-based SSDs, hard drives still have a significant role to play in the market. Technological improvements with hard drives have made them a lot more affordable than SSDs when it comes $/GB comparison. Hard drives are still the most cost-effective storage mediums available in the market, and of course, they are here to stay. The Seagate IronWolf Pro is one marvelous product in the market, as it is one of the firsts hard drive that has reached the 14TB capacity. This new product has enabled data to be more densely packed within the same volume of a 3.5-inch hard drive, and of course, would be a great inclusion for businesses or enterprises that has an never ending amount of data to store. Putting product experience at its core and understanding the needs of their customers, Seagate went further to even include data recovery services for free with the purchase of their hard drives. This really shows how the sale of a hard drive is not just about the physical hard drive itself, but also the value-added service that comes with it. We have got to give it to Seagate for the end-to-end support that they give to the customer. A simple search on a local eCommerce store shows that the Seagate IronWolf Pro 14TB retails at S$815.00. Judging on the various technologies and features of the drives, we’ve got to say that this drive is indeed very affordable. In fact, other brands serve only enterprise grade hard drives at this capacity, and they all cost more than a hundred dollars more than the IronWolf Pro. Seagate has probably saw the opportunity in the prosumer/SME space, and leveraged on the gap within the market. We’re glad that the IronWolf Pro 14TB fits nicely in this market segment, and would highly recommend anyone seeking a new upgrade to their storage system to look out for the IronWolf Pro hard drives.